quick breaths of swooping wonder, multiplied. as miniature bodies scoop down to pool. as Pissarro, but so acrylic in your finish. regretting the lost seed and the found liberty. as far from stringy battery chook as fingers in the fire. bowing and bobbing, rattling plastic mirrors. or make love to that hard, hard-to-get reflection. with that fallen sward of Eire. fluorescing with your simple, beak-filled joys. As to the redux, this poem was posted here once before, a couple of years ago. But it deserves a new airing. 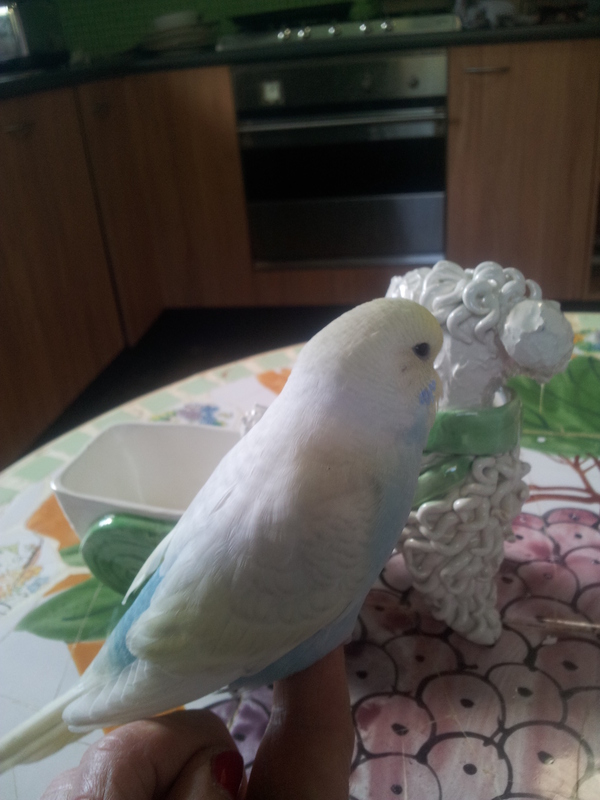 The photo shows my new budgie, more pastel than the wild bird’s near-emerald. He was bought with the seeds of poetry. I am now spending my life moving his cage around and letting him out in safe places, away from my dogs. Next week I promise to use words that rest on a thin perch of ideas, as the last twos paras were totally and tragically Facebook. Status: idiotic. Lovely lovely poem! Also, I have been reading your The Stars Like Sand anthology recently — what a great book! Really enjoying it. Thank you Michele…Tim Jones, fellow editor of Stars Like Sand is also a Tuesday Poet, and I’ll make sure he reads your comment. Thanks Penelope. I really enjoyed reading both of your introductions to the book. And you clearly enjoyed bouncing your ideas off each other! A really enjoyable (not just worthy, or well-written or important, although also all of these) book of poetry, which is rare! I like to think that we broke some new ground. A bit like Matt Damon growing potatoes on Mars, but wordier. Thanks also for your kind comments on “The Stars Like Sand”. Putting it together was a lot of work, but also a lot of fun!